When a sport is rocked by "fartgate", the only thing the person in charge can do is laugh. "We've got to get to the bottom of this," joked Professional Darts Corporation (PDC) chairman Barry Hearn. 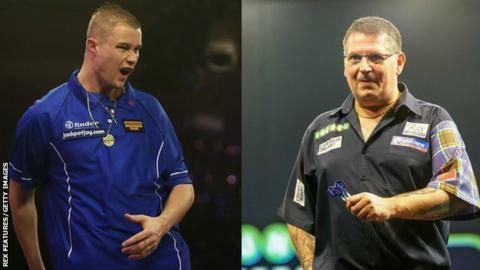 Two-time world champion Gary Anderson and opponent Wesley Harms have denied responsibility for "rotten egg smells" on the oche. Scot Anderson beat his Dutch opponent 10-2 at the Grand Slam of Darts in Wolverhampton on Thursday. Hearn told BBC Sport the Darts Regulation Authority had the power to fine or suspend players guilty of gamesmanship or a lack of professionalism. It has been pointed out on social media that the deep-voiced caller Russ Bray also shared the stage with the players. "I guess people wonder if blowing off might constitute advanced gamesmanship. Then again, Russ was just about within farting distance," said Hearn. Bray, a popular caller with 22 years' experience, has categorically denied being the culprit. He declined to comment further when approached by the BBC. Hearn said the controversy was "unique" in his experience of professional darts. After being blown away by 47-year-old Anderson, Harms kicked up a stink, accusing the Scot of leaving a "fragrant smell". The 34-year-old told Dutch TV station RTL7L: "It'll take me two nights to lose this smell from my nose." World number four Anderson let rip when he heard the accusation, saying the smell had definitely come "from the table side" at the Aldersley Leisure Village. "If the boy thinks I've farted he's 1,010% wrong," he told The Sun. "I swear on my children's lives that it was not my fault." Hearn has helped transform darts in recent years with sellout arena shows involving the likes of Anderson and other world champions such as Michael van Gerwen and Rob Cross. It is the second most-viewed sport on Sky, behind football. In the Grand Slam of Darts, PDC players take on competitors from the British Darts Organisation (BDO). Anderson is in action on Saturday when he faces surprise package Michael Unterbuchner, the last remaining BDO player, in the quarter-finals. If the 2015 and 2016 champion, nicknamed the 'Flying Scotsman', wins that match, he will remain on track to face Michael van Gerwen in the semi-finals. Dutchman Van Gerwen, chasing a fourth consecutive Grand Slam crown, takes on Jonny Clayton, the Welshman who ended his 21-game unbeaten Grand Slam run in this year's group stage. This is not the first time a sport has tried to clear the air after someone was alleged to have broken wind. Snooker player Bill Werbeniuk caused a stir when he had a bout of flatulence during a World Championship match at the Crucible in Sheffield. "It was the most enormous noise, but what happened next was genius comic timing," recalled Hearn, who is also chairman of World Snooker. Canadian Werbeniuk turned round to an elderly woman in the crowd and said: "Was that you?"